High R-waves with ST-depression in V1-V3. 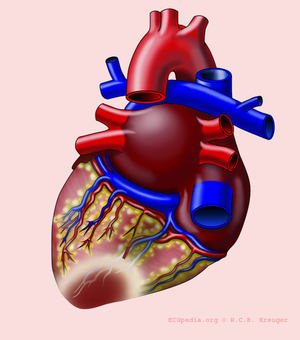 The posterior wall is usually supplied of blood by the RCA. Because no leads "look" at the posterior wall in the normal ECG, no leads show ST-elevation in case of a posterior wall infarction. The ST depressions in V1-V3 that can be observed in case of a posterior wall infarction are in fact mirrored ST elevations and the high R-waves are the Q-waves of the infarct. To be able to confirm a posterior-infarct, leads V7, V8 and V9 may be helpful. These leads are horizontally placed from V6 to the back and do show the ST elevations of the posterior wall. This page was last edited on 25 September 2009, at 18:20.